Located on southern Thailand’s east coast, 800 kilometres south of Bangkok, Krabi Province is an area of outstanding natural beauty covered with exotic islands such as world renowned, Koh Phi Phi. Classic virgin beaches competing with towering limestone formations and surrounded by crystalline waters fringing with colourful coral reefs. Beside the sea and sand, there are towering rocky cliffs, caves harbouring Buddhist temples, running waterfalls, seemingly endless plantations of rubber and oil palm trees, lush and green national parks, home to different species of fauna and flora, verdant mangrove forests and inlets that wind their way under soaring cliffs of karst mountains, and much more. As well as beautiful and relaxing scenery, Krabi offers a unique “Mother’s Nature Playground” for those who like to be “out there”. Rock climbing, diving, kayaking, sailing, deep-sea fishing, bird watching, snorkelling, island hopping, elephant and horse riding, camping and barbecue activities are just a few. In the interior hinder land, two predominantly national parks, Khao Phanom Bencha and Than Bok-khorani offer rainforest attractions including waterfalls and caves, hotsprings and opportunities for jungle trekking, bird watching and eco-tours. Enjoy the beautiful white sandy beaches, the colored mountains, the turquoise water and the incredible blue sky. Many people said that the power of nature had swept away many man-made things, and returned it to it’s natural beauty and made Krabi like Krabi 10 years ago a place of beauty. Krabi has a number of beautiful beaches such as Ao Nang, Rai Le, Tham Phra Nang, Noppharat Thara and also many beautiful islands. The three most popular being Phi Phi Island, Phoda Island and Kai Island. ” A place you should be with your family. Don’t forget to snorkel. Beautiful fishes and corals are down there. So of you are beach lovers and like to snorkel, you guys should put this on your list. ” I’m astounded to see even more fish than I have never seen before, like coral trout and beaked angelfish. Tourists from around the world visit Ao Nang, with it’s famous sunset and a wide white sandy beach it is the most well-known beach in Krabi. Shops and restaurants along the beachfront are being rebuilt and renovated, and the walkway has been redesigned to its original order. Krabi has always been an important destination for tourists to visit, so this is now an opportunity for airlines, hotels and restaurant owners to give discounts and put together attractive packages to bring the tourists back to Krabi. So of you are beach lovers and like to snorkel or dive in privacy come to Krabi now before the crowds return. This seaside province is located in the Andaman Sea. The province is full of white sandy beaches, crystal clear seawater, beautiful islands, verdant forest with caves, and waterfalls, including more than 100 offshore islands. Krabi is located 814 kilometres from Bangkok, covering an area of 4,708 square kilometres. From archaeological discoveries, it is believed that Krabi was one of the oldest communities in Thailand dating from the prehistorical period. It is also believed that Krabi was once the town of BanThai Samo, one of 12 royal cities that used a monkey as the town symbol. Krabi was a dependency town of the Nakhon Si Thammarat Kingdom. Another legend indicates that the town may have taken its name after the meaning of Krabi, which means sword. This may have stemmed from a legend that says an ancient sword was unearthed prior to the city’s founding. Later, the sword became a symbol of Krabi. The province consists of mountains, hills, plains and mangrove forests, including more than 130 large and small islands. Krabi town has a 5 kilometre long river, which flows through town and ends at the Andaman Sea in Tambon Pak Nam. There are several canals in Krabi including Khlong Pakasai, Khlong Krabi Yai and Khlong Krabi Noi, all of them originate from Phanom Bencha mountain range, the highest mountain range in Krabi. Krabi is administratively divided into 8 Amphoes (districts) : Amphoe Mueng, Khao Phanom, Khlong Thom, Plai Phraya, Ko Lanta, Ao Luek, Lam Thap and Nuea Khlong. Ao Nang is a central point of the coastal province of Krabi, Thailand. The town consists chiefly of a main street, which is dominated by restaurants, pubs, shops and other commerce aimed at tourists. The main beach is used by sunbathers to a certain extent, but there are hundreds of longtail boats which offer access to other beaches on the mainland and on nearby islands. There are a number of scuba diving centres, most of which offer basic diving courses. The islands outside Ao Nang are relatively easy to access and uncrowded compared to many of the diving sites around Phi Phi Island. Climbing is another activity widely available through centres in Ao Nang, although most of the climbs are actually in the areas around the Railay, Tonsai and beaches.Phra Nang The main beach at Ao Nang is the main departure point for boats to a number of places, including the nearby resort of Railay (or Rai Leh), which cannot be accessed by road, Poda Island and Chicken Island. This is a 3 kilometres long sandy beach located 6 kilometres from Ao Nang. The beach paved with tiny seashells, was formely called “Hat Klong Haeng” by locals, which means dried canal beach. The canal will dry up during low tide and the area turns into a long beach. The headquarters of Hat Noppharat Thara-Mu Ko Phi Phi National Park are situated here. The park covers a large area both onshore and offshore. This beach is generally divided into two sections, east and west. West Rai Le offers a broad sandy beach. Although it has less facilities to offer than Ao Nag, West Rai Le is quieter and more peaceful. Across the peninsular from West Rai Le is East Rai Le, which varies from the other beaches in the area. It could actually be classified as a mud flat, especially during low tide. Even so, it does offer some rather remarkable views. One end of the beach is covered with mangroves. Accessible only by boat, this sweeping beach offers fine-grained white sand and crystalling waters, as well as magnificent jagged karsts. Although visitors flock to this beach year-round, it is still extremely pristine, and considered to be the most attractive in the area. The Inner and Outer Phra Nang Caves, and Phra Nang Lagoon are close by, and offer some truly spectacular views. Accommodation is available over a wide price range. Despite the fact that it is reachable only by boat, this area offers plenty of recreational activities. Khao Khanap Nam is regarded as the symbol of Krabi. It sits before the city and cen be visited by long tail boat from Chao Fa Pier. Travel time is about 15 minutes. From the boat, one climbs a staircase to see caves with stalactites and stalagmites. 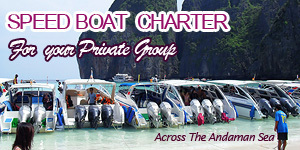 A boat can be rented at 300 baht per trip to visit Khao Khanap Nam, mangrove forests and Ko Klang fishery village. This agrotourism attraction, supported by the Department of Agricultural Extension, is some 20 kilometres from Krabi on the way to Amphoe Ao Luek. The centre covers a large area with a collection of local fruits, flowers and economic plants. Phi Phi Islands are located at an equal distance from both Krabi and Phuket, about 40 kilometres. Made up of six small and large isles, the main feature s are sheer limestone cliff and rock. Some offer beautiful beaches and coral reefs. The best time for a visit is between November and April. Ko Phi Phi Don covers an area of 28 square kilometres. Laem Tong in the north offers beautiful marine nature. Diving can be done as well at Laem Hua Raket, Hat Yao and Hin Phae. A number of accommodations are available at Ao Ton Sai, and Ao Da Lam. Ko Phi Phi is a lovely island that covers an area of only 6.6 square kilometres. It is surrounded by limestone mountains and high hills with jutting cliffs. The sea is 20 metres deep and the deepest point in the south of the island is around 34 metres. Ko Phi Phi Le offers superb scenic bays such as Ao Pi Le, Ao Maya, and Ao Lo Sa Ma. In the northeast of the island is a large cave called “Tham Phaya Nak” or Serpent Cave by His Majesty King Bhumibol Adulyadej because of a stone resembling the mythical creature, which His Majesty saw when he paid a visit in 1972. The cave is considered sacred to locals who came here to collect swallow nests. Inside the eastern and southern parts of the cave are ancient colour paintings of elephants and variuos types of boats, including an Arabian sailboat, a European sailboat, a sampan, a Chinese junk, and a steamboat. It is believed the paintings were the works of merchants or pirates because the study of west-to-east ship routes indicates that this area may have been a stopover for boats seeking shelter from storms, transferring cargo or making repairs. Ko Yung is north of Ko Phi Phi Don. The island has a stone beach in the east and small sandy beaches amid valleys. It is teeming with various kinds of colourful coral reefs. 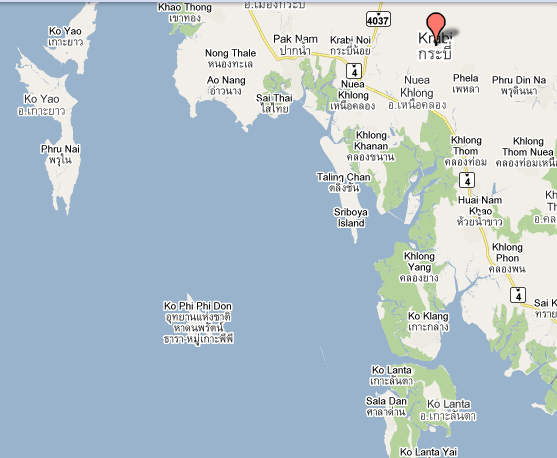 Ko Phai is north of Ko Phi Phi Don and not far from Ko Yung. Marvellous beaches are in the north and east of the island. The bank of coral reefs with antler corals, in partivular, stretches from north to south of the island. The best time to visit Phi Phi Island is during the monsoon-free season, which is from November to April. Koh Lanta consists of two adjacent islands: Koh Lanta Yai and Koh Lanta Noi. Koh Lanta Yai, this island is home to “Chao Le” or sea gypsies who continue to maintain their traditional lifestyle and beliefs, such as setting a boat adrift to drive out evil and bring good luck, which is practiced during the full moon in June and November. In addition, the island provides tourist facilities while Koh Lanta Noi is the location of the district office. Most of the beaches on Koh Lanta Yai such as Kho Kwang, Khlong Dao, Phra Ae, Khlong Khong, Khlong Nin and Ba Kan Tiang lies in the west, can be reached by road and offer a wide range of accommodation. 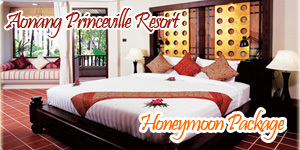 Situated at Ban Laem Pho, 17 kilometres from town. The area was once a large freshwater swamp, home to a kind of snail. Over eons dating from the Tertiary Age, about 40 million years ago, these small snails lived and died by the million. Eventually, weather changes caused the swamp’s disappearance, but by then the layer of fossillised snail shells was forty centimetres thick, resting on ten centimetres of lignite below which is the subsoil. Because of geographic upheaval, the fossillised shells are now distributed in great broken sheets of impressive magnitude on the seashore at Laem Pho. This cave is at Ban Nong Ngok, 7 kilometres from Krabi town. The villagers named it to mark the visit of King Rama IV (before he ascended to the throne). The cave features marvellous stalactite and stalagmite formations.